I’d been curious for a little while about one of the products I’d spotted in the farm shop I like to use when I visit Suffolk and then a couple of weeks back two things conspired to make me get on with trying it out. First I was reading Hugh F-W’s weekly slot in The Guardian (‘Trickle treat’ on 7 March) and then I went out for dinner at ‘The Lighthouse’ in Aldeburgh and when they brought the bread with oil and balsamic they explained that the oil was a local product made from rapeseed (in fact just theone I’d been eyeing up). Oh that terrible stuff that blights the English countryside in May covering all the fields in a yellow haze of flowers. Grrrr that’s the stuff that gives me major hayfever as soon as I step anywhere outside of a town centre and nearer to the countryside. Isn’t that grown for them to feed to cattle or something like that? Isn’t that just horrible industrial extracted oil used in ready meals and other stuff that’s bad for us? Don’t they use that in bio-diesel? But maybe we haven’t got all this quite right. 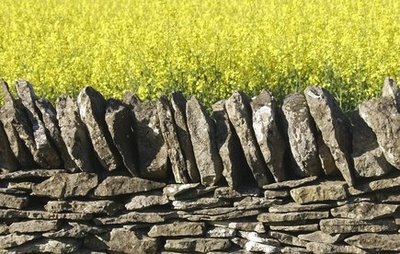 Firstly not all rapeseed flowers are yellow – you sometimes see purple ones, but they are mainly yellow and they are a bit of a blot on the landscape when in flower. We should however remember that the English landscape (as any other) is a changing thing, after all it used to be mostly woodland before it was rolling hills with wheat waving in the gentle breeze. But we are also right to there be concerned that a crop takes over an area and we get a monoculture. I’m not a doctor so the link to hayfever and asthma is not my specialist subject. A quick search via Google (see for example Wikipedia and also The Independent as examples) however suggests that the link is not definitive, as rapeseed does not have wind born pollen. I imagine there’s plenty out there would testify that it triggers some kind of reaction for them. Yes they do use it in cattle feed, yes some of it is extracted using industrial means but some is now produced like virgin pressings of olive oil; and yes they do use it in biodiesel. But does that matter and does it taste any good? Colour wise the differences were pretty marked; the hemp was a dark green and slightly cloudy, the rapeseed a soft yellow and the olive a mid green. The viscosity seemed pretty much the same when I looked at how they coated the back of a spoon. Smelling them started to hint at the taste differences to come and this was confirmed by tasting directly from a teaspoon and with bread (Village Bakery Organic Campagne – a sourdough loaf). Hemp: this is very unusual and a bit of an acquired taste – this actual tasting is the third time I’ve tried it since buying the bottle and it is growing on me slowly but I’m not quite convinced just yet. It has a strong flavour, which comes across as earthy and almost woody. The finish is quite long. It was better on the bread that it was ‘pure’ and contrasted the sourdough quite well. It makes a good change from olive but I doubt some people will ever be convinced that it’s a good substitute. Olive: this was fairly fruity with a slight tang and peppery endnote. Its not a very strong oil but its nicely mild with the classic Italian notes. It was good with and without the bread but lets remember that this is the oil I have been using for a couple of years now as my basic olive oil so I’m used to its flavours. Rapeseed: this has a mild and mellow taste. There’s a slightly nutty fruity seeds flavour that I couldn’t quite identify (I’m not sure its grassy like HFW says but then I was tasting a different brand). It was good on its own, but stood up to the bread test less well. The loaf though has a very distinctive sourdough flavour so this oil might work better with a milder flavoured loaf – it was certainly good when we had it at ‘The Lighthouse’ with balsamic. It’s also a good cooking oil – less distinctive than olive oil so better in some dishes and also with a nice high flame point making it better for sautéing. Overall? I’ll stick with olive for a lot of things but the rapeseed is a definite permanent addition to the kitchen and I’ll keep trying the hemp but I’m not sure I’m ever going to be a big convert. Hugh FW suggests it more sophisticated than the rapeseed but actually I just think it’s stronger and more unusual but unusual does not always tally with sophistication and in this case I’d say it’s quite hard to get to know and love. 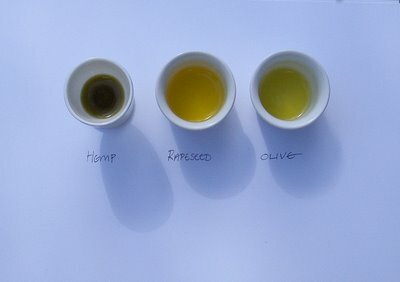 Different brands of cold pressed rapeseed oil will have different flavours, and each brand may have a slightly different taste from year to year. This due to the simple way in which the oil is extracted, i.e. no other flavourings or preservatives are added. We produce a ‘cold pressed rapeseed oil’ in Scotland, some people say they can detect a slight taste of asparagus, other say peas. 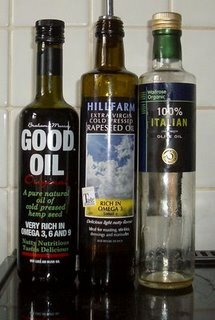 I’m a big fan of rapeseed oil and now use it more than olive oil. I mostly use a brand called Mellow Yellow. I get it from my local farm shop, but Waitrose apparently sell it. Since I did this tasting I’ve also tried another cold pressed rapeseed oil from Munns in Cambridgeshire which I also enjoyed. I’m definitely a convert to rapeseed and am surprised I’d not discovered it before now. Mark: thanks for the tasting hints – I can see the similarity to peas now you mention this. Jules: I think I’ve seen the Mellow Yellow brand in my local Waitrose so I’ll give that a go next. I can definitely see the balance in my cooking shifting away from olive oil. Delighted everyone is catching on to the wonderful properties of cold pressed rapeseed oil. We produce Farrington’s Mellow Yellow on our farm in Northamptonshire, and not only is it wonderfully versatile, but also extremely healthy with very low saturated fat (half that of olive oil) and full of Omega 3. Please visit our website for recipe ideas, my personnal favourite will be here soon which is BBQ British asparagus. The Romans introduced rapeseed to Britain, but it really took off in the 1970’s. All rapeseed is yellow, with the purple fields being linseed or borage. You are right about hay-fever, as the pollen is too big and sticky to get air borne, unlike Scandinavian pine tree pollen which is in the atmosphere at the same time as the yellow fields are visible. Rapeseed does however give off natural phenols which are sometimes noticed as a cabbage like smell, which do irritate some people. We grow the crop as part of a rotation under LEAF Marque systems to ensure there is no monoculture, and care is taken for the environment. Mellow Yellow is available nationwide from farm shops through to select multiples. Great tasting notes – and thanks too to Mark for his additions. I hadn’t put my finger on the pea taste but it rings true. Hi there, thanks for writing about GOOD OIL! It is great to see more people interested in British oils, especially those with great health benefits such as ourselves. We also produce a Mild & Light version of GOOD OIL down at our farm in Devon, which we developed specifically for those who found the Original a bit strong. Maybe give it a shot and see how you like it? Hopefully it will become a permanent addition to your kitchen as well! Caroline: thanks for the tip re 'mild & light' – I saw this at the time but chose to go with the full on version. I'm going to do a re-taste soon and include the lighter version.